A woman is questioning H&M’s sizing practices. Ruth Clemens wrote a letter to the company on Facebook about how she couldn’t fit into the company’s size 16 jeans after visiting a store in the UK. She suggested that the company is selling clothes that are so small they’re keeping curvy and plus size women from being able to find clothing that fits. “As I’m sure you’re aware, size 16 is the largest size you stock (apart from in your plus size range, which is very limited in store and does not offer the range of styles for the fashion-conscious that are available in smaller sizes),” she wrote. More frustrating to Clemens is that she isn’t even plus size, which suggests that H&M is excluding many women from shopping in its pants section. 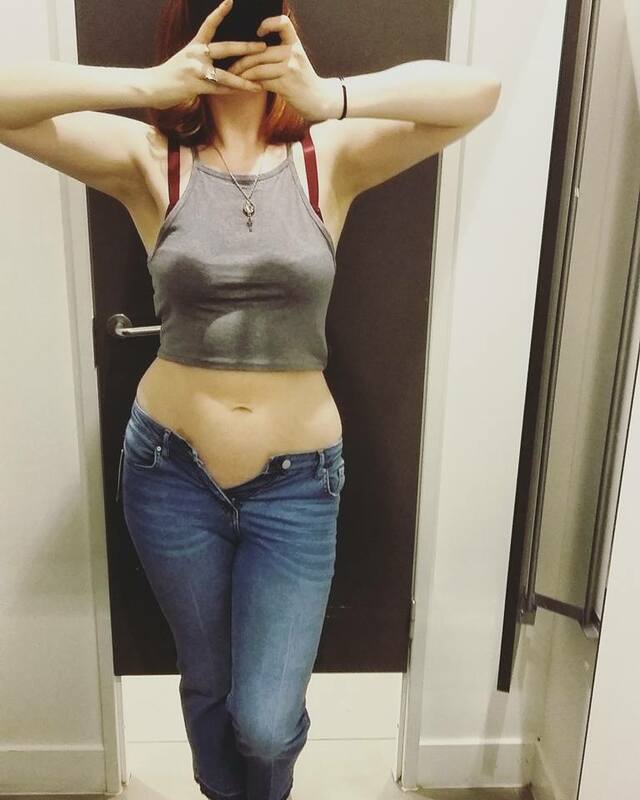 She took a photo of herself wearing a size medium shirt from the store, while wearing the unbuttonable pants. “Hi Ruth, thank you so much for your feedback. We are sorry to hear about your experience in store recently. We always want our customers to have an enjoyable time when shopping in store and to leave feeling confident in themselves. At H&M we make clothing for all our stores around the world, so the sizing can vary depending on the style, cut and fabric. We value all feedback and will take on board the points you and other customers have raised,” the company wrote in a comment. I was browsing your sale items in your Leeds store and spotted this pair of kick flare jeans. They were only a tenner – bargain! – and a size 16. I’m normally a size 14 on my hips (occasionally 16 if buying trousers) so I thought I’d try them on. It did not go well. As I’m sure you’re aware, size 16 is the largest size you stock (apart from in your plus size range, which is very limited in store and does not offer the range of styles for the fashion-conscious that are available in smaller sizes). I am not overweight (not that that should matter) and although I’m 5 foot 11 my body is pretty average shape-wise. It’s already difficult enough for me to find clothes that fit well because of my height, why are you making jeans that are unrealistically small? Am I too fat for your everyday range? Should I just accept that accessible and affordable high street and on-trend fashion isn’t for people like me? You might recognise the top I’m wearing – it’s one of yours and it’s a size Medium. Sort it out would you.